What Are the Benefits of Blueberries for the Skin? 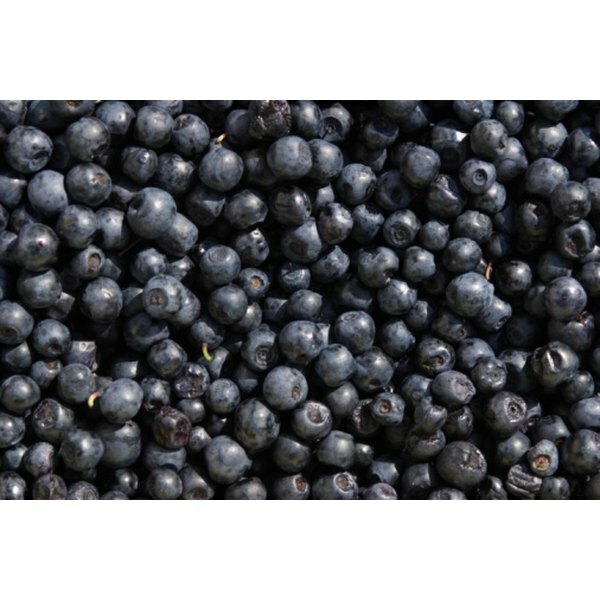 Blueberries are rich in fiber as well as vitamins A and C, while low in saturated fat, cholesterol and sodium. They are also a good source of antioxidants, and can be eaten raw, cooked with other foods, or dried for use in tea. No matter what form blueberries take in your diet, their many vitamins and nutrients can be good for your skin. Whether you suffer from acne, broken capillaries or splotchy skin, the nutrients in blueberries will help. Although acne is typically attributable more to hormones than to the physical condition of your skin, certain nutrients can counteract the hormonal conditions which encourage pimples. Many of the vitamins in blueberries may neutralize or normalize oil levels in your skin, making it healthier and less likely to accumulate sebum. Vitamin A, in particular, is used in a variety of acne-related skin treatments. Breaking of the capillaries under your skin can occur under a hard impact, which often leads to bruising, but it can also occur due to weakness within the vessel walls. When this occurs, skin may become splotchy, or tiny red lines may be visible under your skin. Sometimes called “spider veins,” these broken capillaries can be unsightly and may take months or years to heal and disappear. The stronger your capillaries, the more resistance they are to breaking. The vitamin C in blueberries can help to strengthen the blood vessels just below the surface of your skin. The antioxidants and phytochemicals found in blueberries help to neutralize free radicals, which might otherwise damage skin cells, leaving your skin with a younger and softer look and feel. A diet high in fat and carbohydrates can also encourage skin aging, so blueberries prevent aging by providing you with many needed nutrients while providing very low levels of fat and cholesterol. Fiber has no direct effect on your skin, but it does play a prominent role in the regulation of your digestive system and bowels. By ensuring proper digestion, it facilitates the timely removal of waste and toxins from your body. When your body is free of toxins, your overall health is better and your skin is one organ that is visibly more healthy. Fiber also absorbs some of the fat and cholesterol you get from food, leaving less to affect the health of your skin. Mayo Clinic; Foods for Healthy Skin: Top Picks; Lawrence E. Gibson, M.D. Can You Get Rid of Pimples with Vitamins?